As safety is paramount in building a handrail or any project, Eye Screws unquestionably are vital components in designing and installation. Keble's Trading offers stainless steel Eyes Screw Forged Collar from 5 x 50mm to 12 x 160mm range of size. Our stainless steel Eye Screws are manufactured using the fine quality of 316 marine grade stainless steel. We source our stainless steel eye screws from worldwide leading manufacturers to ensure that you get consistent solid-quality products for your projects. 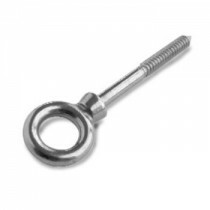 Turn to Keble’s Trading for reliable-grade stainless steel EYE SCREWS. Talk to us! We speak your language! We understand your business. Call us at 1-800-067-687 or fill out the contact us form below. No inquiry is too large or too small. We would love to be of service to you today!